Every summer for the past 200 years, the Munster Agricultural Society has put on a very special show in Cork. 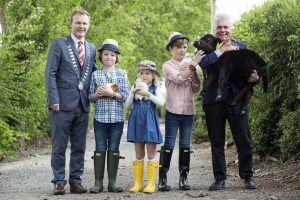 A great family day out and Cork tradition, the Cork Summer Show, sponsored by Cork County Council, takes place on 17th and 18th June at the Showgrounds at Curraheen and this year it promises to be the biggest and best show yet. From pig agility courses to the All-Ireland Cook off heats, from pet dog shows to best in breed livestock competitions, vintage motors and high tech farm machinery, live music with great food and craft beers, the Cork Summer Show brings together so much fun in one place that it has to be one of the best days out of the summer in Ireland. At just €25 euro for a family ticket (booked before 10 June), the Cork Summer Show also represents great value for all the family to enjoy a special day in the countryside, only a few miles from Cork city. A snapshot of Ireland’s incredible farming life, the 100-acre site becomes home to more than 1,700 animals including 700 horses, 120 sheep, 80 goats, 100 poultry and 400 cattle. There will also be more than 300 dogs competing across 9 categories in the pet and pedigree dog shows. The Cork Summer Show includes farrier tents for shoe-ing horses, show jumping, dressage and livestock competitions, poultry shows alongside vintage tractors and high tech farm machinery, free children’s play zones, the region’s largest food market with everything from bouncy castles to pet farms where you can stroke a lama or hold a baby bunny. “The Summer Show is synonymous with Cork and it is an honour and privilege for Cork County Council and myself, as County Mayor, to support it every year. There is something there for young and old from food to singing to a funfair so come along and enjoy yourself,” said Mayor of the County of Cork, Seamus McGrath. This year will also feature a special Ford Vintage Run, to mark the 100 years of Ford in Cork, which is set to include both farming and passenger vehicles, as well as all the fun vintage farm machinery up to the latest, highest technology in motoring. There is also a super musical entertainment line up, an increased free children’s playzone and a bigger pet dog show arena, due to the popularity of this competition each year.